Oracle in collaboration with Intel recently organized an “Oracle Enterprise Cloud Summit” to underline how Oracle Cloud offerings can help organizations improve efficiency and profitability while reducing costs. The highly available cloud computing platform is a natural evolution of datacenter trends including virtualization, consolidation, and shared services. 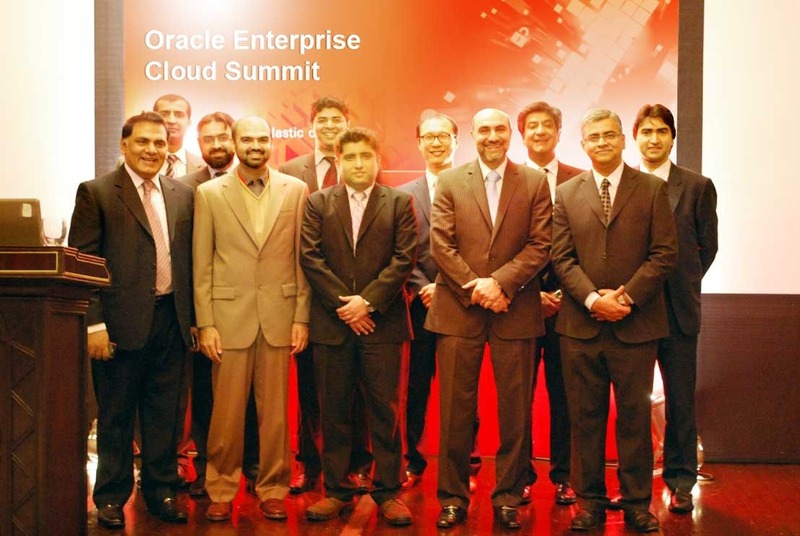 Seen in the picture (Front row – 2nd from right) Ahsen Javed, Managing Director, Oracle Pakistan and South Asia Growth Economies – West with Mr Naveed Siraj , Country Manager , Intel Pakistan Corporation (First Row-1st from right) along with other Oracle Executives present on the occasion. Cloud computing is dead in Pakistan. Electricity is expensive. Internet is expensive. I can get 4 XEON processor VPS in UK with 3.5GB RAM and 90GB drive for less than Rs 10,000/mo. Can I get anything similar in Pakistan?